This is the second post of a series in which I am reviewing the four major options for electronically accessing the Dead Sea Scrolls. The plan for this series is posted here. Logos, BibleWorks, and Accordance all offer electronic Dead Sea Scrolls in the original languages and in translation. Brill also sells the Dead Sea Scrolls Electronic Library, vol 3. The DSS resources offered by these companies, however, are not all created equal—the coverage of the Scrolls in each platform varies, as well as the quality of the products. In this post I will describe exactly which Dead Sea Scrolls are available on each platform. Along the way, I will also note instances where the product pages include typos or are unclear. At the end of the post I have included a table that summarizes which texts are available in each program. The QSM contains all non-biblical manuscripts from what are commonly known as the Dead Sea Scrolls. Here, “Dead Sea Scrolls” is being used in the narrow sense, referring only to Qumran scrolls. Granted, the most important non-biblical texts are from Qumran, but the description could be more clear. This bundle includes two modules: (1) a translation of the biblical DSS and (2) a translation of the Hebrew/Aramaic non-biblical texts from Qumran. Both of these translations have been published in print, as well. The translation of the non-biblical texts is that of Wise, Abegg, and Cook (print edition). This is probably the most popular English translation of the non-biblical Qumran scrolls. 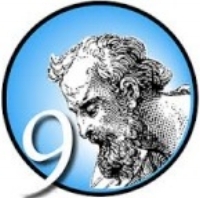 The translation of the biblical DSS is Eugene Ulrich’s (et al.) The Dead Sea Scrolls Bible (print edition), the only available English translation of all the biblical DSS. Logos offers three original languages DSS resources, including all the biblical DSS, and a few English translations. Originally designed for Accordance, this module Includes all the Hebrew/Aramaic non-biblical texts from Qumran. This is an electronic version of the second edition of The Dead Sea Scrolls: Study Edition (print version). It includes all the Hebrew/Aramaic non-biblical DSS from Qumran and an English translation. This product is not morphologically tagged, but one can set the transcriptions so that they scroll side by side with an updated edition of Florentíno García Martínez’s highly respected The Dead Sea Scrolls Translated. It would be helpful to know exactly which sites are included. Scrolling through the Bible Reference Index, I see that there links to DSS from at least Qumran, Naḥal Ḥever, Wadi Sdeir, and Wadi Murabaʿat. The product is mislabeled. It includes more than just the Qumran biblical DSS. A popular translation of the Hebrew/Aramaic non-biblical DSS from Qumran by Wise, Abegg, and Cook (print edition), also available in BibleWorks, and Accordance. This product is listed in the “Original Languages” section and the “Translations” section because it includes both. The translation is an updated edition of Florentíno García Martínez’s highly respected The Dead Sea Scrolls Translated. This is the 4th edition (1995) of Geza Vermes’ translation of the Hebrew/Aramaic non-biblical Qumran scrolls. First published in 1962, Vermes’ translation has become a classic. In fact, in subsequent editions it was incorporated into the Penguin Classics series. The most recent edition is the 7th, published in 2011. A translation of all the biblical DSS by Eugene Ulrich (et al.). The Dead Sea Scrolls Bible (also in print) is the only available English translation of all the biblical DSS. Accordance offers all the Dead Sea Scrolls in the original languages, as well as English translations of all the biblical DSS and the non-biblical scrolls from Qumran. Accordance sells these resources individually and in various combinations. So I have included an extra “Combinations” here. This module, available on each of the four platforms, was originally designed for Accordance and includes all the Hebrew/Aramaic non-Biblical texts from Qumran. Accessing this module in Accordance, one is sure to have the latest edition of these texts. All the biblical Hebrew/Aramaic Dead Sea Scrolls are included—from Qumran, Masada, Naḥal Ḥever, Murabbaʿat, etc. Two modules are included: one allows the user to display the biblical DSS in canonical order (DSSB-C), the other according to the manuscript numbers (DSSB-M). You can read more about this product, including a glowing endorsement from Emanuel Tov, in The Dead Sea Scrolls Biblical Manuscript article. All the Greek biblical Dead Sea Scrolls are included. Like the Hebrew/Aramaic database, the DSS Greek Bible includes two modules: one that allows the user to display the text in canonical order (DSSGB-C), the other in manuscript order (DSSGB-M). This module completes Accordance’s exhaustive DSS offerings, as it includes all the non-biblical, non-Qumran texts. Accordance’s Dead Sea Scrolls Resources page says that the texts can be displayed in canonical and manuscript order, but this is a typo by nature of the fact that the texts included are non-biblical. An Index of Qumran and other DSS manuscripts, with description, paleography, dating, and bibliography, edited by Dr. Martin G. Abegg, Jr. The DSSB Variants Tool is not just intended to provide a list of variants, but a dynamic searchable database that is useful for scholarly research. This tool can be used in conjunction with biblical modules such as HMT-W4 and DSSB-C or any text that follows canonical order giving the user an immediate view of differences between the MT and the ‘biblical’ DSS. As a user scrolls through the biblical texts this tool will reveal true variations between these corpora for each verse in a separate pane or window. This is Wise, Abegg, and Cook’s translation of all the Hebrew/Aramaic non-biblical Qumran scrolls, also available in BibleWorks and Logos. The translation of all biblical DSS by Eugene Ulrich (et al. ), also available in BibleWorks and Logos. This package includes all the resources listed above in the “Original Languages” section, as well as the Index of Dead Sea Scrolls Manuscripts. This package includes all the resources listed above in the “Translations” section, as well as the Index of Dead Sea Scrolls Manuscripts. This package is a combination of the non-biblical DSS resources in the original languages and in English translation. This package is a combination of the biblical DSS resources in the original languages and English translation. This package includes all of Accordance’s DSS texts in the original languages and English translation, as well as a collection of monographs on the DSS that will be discussed in a future post on secondary resources. Unlike the products listed above this is not an DSS add-on to a Bible software program. This is an integrated collection of electronic texts that runs within version 7 of WordCruncher software. The first two volumes of this series are no longer sold by Brill. Volume 1 (1997) included images of all the biblical and non-biblical DSS available at the time. Volume 2 (1999) included all the Hebrew, Aramaic, Nabatean, and Greek texts from Qumran and a selection of texts from Wadi Murabbaʿat and Naḥal Ḥever. Volume 3 replaces and updates volume 2 with a couple additions and subtractions. Volume 3 includes all the Hebrew/Aramaic non-biblical Qumran scrolls in the original languages with full morphological tagging and search capabilities, high-resolution images of all the texts included, as well as an inventory of Qumran texts that is a 2005 revision of Emanuel Tov’s original publication in DJD 39 (2002) 27–114. The transcriptions are, for the most part, from DJD. An English translation of each text is included from either DJD, Martínez, or Wise, Abegg, and Cook. In addition, a morphologically tagged Hebrew Bible is included, as well as a module that combines the Qumran non-biblical DSS with the Hebrew Bible for morphological searches across both corpuses. According to both the editor of volume 3 and a WordCruncher representative, the biblical Qumran scrolls (texts and images) are being prepared now and will seamlessly integrate with the non-biblical scrolls. I got the impression from the WordCruncher representative that the biblical Qumran scrolls might be ready to go by November at SBL. 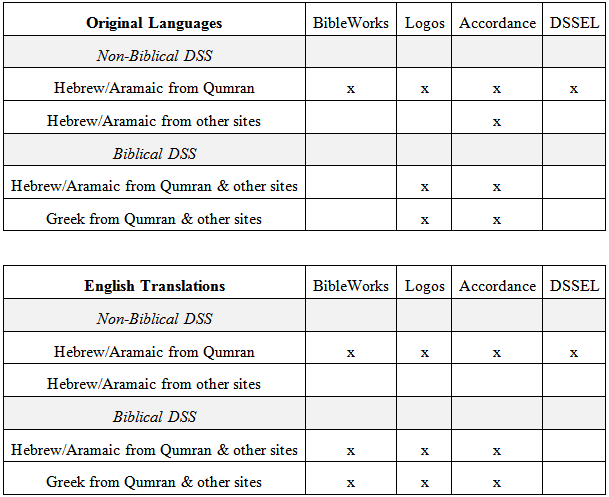 Note: On certain platforms the packages that include these texts come with additional resources that are not listed in this table—Logos’ biblical DSS includes an index of extant DSS for each verse of the Bible; some Accordance combinations include a very robust index of all the DSS with description, paleography, dating, and bibliography; the DSSEL includes high-res images, an index, and more. In the next post, I will discuss how each platform allows users to display the texts, and I will comment on the quality with which each database has been implemented. Way to go, man. Great series so far. This will save some people a lot of time, I think! Looks like as far as content is concerned Accordance slightly edges Logos. That is true, but the difference between the two programs is not slight once you factor in quality and functionality, which I will talk about in the next post. Accordance has always been at the leading edge of DSS resources because of Marty Abegg’s work. Indeed. I am going to try to get a little info on the relationship between Abegg and Accordance and, maybe, feature it as a separate post.